Punto de Vista does not wish to be isolated from one of the present-day tragedies, that of the refugees, and in its next edition, there will be room for a series of short films shot first-hand by refugee girls at a camp in Jordan, which will be screened as the prelude to each session of the official section. 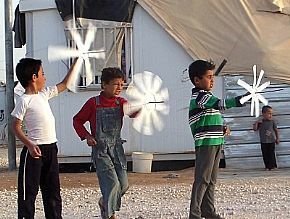 It is a set of seven films that are the result of film workshops given by the North American educator, Laura Doggett at the Syrian refugee camp of Za’atari, in Jordan, the world’s second largest camp and home to 50,000 children, and also in the Jordan city of Irbid in the north of the country. The pieces, all of which were filmed by girls between the ages of 15 and 18, are a first step in the world of film, in the form of a diary that shows their personal lives in this provisional city that the War has forced them to live in. There are seven pieces that are just a few minutes long but are portrayed with a profound story and a fresh outlook. The testimony of the refugee is finally personal and direct, something that we are not used to seeing or hearing. Affected by the tragic stories she heard when she visited the camp, Doggett decided to organise, with her co-facilitator Tasneem Todhoj, two film workshops to offer the refugee girls the opportunity to tell their own stories in first person through a camera. The films that Punto de Vista will screen were filmed over a few weeks, during which time the girls had to start by learning how to handle a camera. In the words of the coordinator of these workshops, “I cannot imagine what these girls would be capable of doing if they were given the opportunity to continue this work in a sustainable way. For these girls, telling their stories offers them the possibility not only of changing the path of their personal lives, but also presenting this possibility for change to other girls, and offering alternative ways of observing, both the people of their communities and the rest of the world”. Doggett assures that the experience of narrating their daily lives transformed the inhospitable landscape of the refugee camp into new, fertile soil for exploration, self-discovery and self-expression. The workshop at the Za’atari Camp was sponsored by a Felsman Fellowship, Save the Children International and WomenOne. The workshop in Irbid is backed by the International Rescue Committee. Another Kind of Girl, directed by Khaldiya Jibawi. The Girl, Whose Shadow Reflects the Moon, directed by Walaa Al Alawi. Dreams without Borders, directed by Muna Al Hariri. Barriers of Separation, directed by Raghad Al Khatib. The Silence of Nature, directed by Bushra Al Masri. Children, directed by Marah Al Hassan. The Long Road, directed by Rafif Al Fadel.